I went to Lubbock the weekend of September 15 - 16 to celebrate my 46th birthday with my family. My oldest sister, Lilly, and her husband, Clyde, threw a birthday BBQ for me with some help from my older sister, Eva. I get a huge satisfaction out of calling them oldest and older! :) It was well attended and I saw folks I had not seen in 9 years! I even met a great nephew that I thought was still a baby, and he is 8 years old! That is what happens when you have a large family. You forget who was born and who got married, who got divorced and who turned what. As life goes along, I expect folks to continue looking as they did the last time I saw them. I could not get over the changes just since May when I was there last. One nephew moved to Austin, a great-nephew flew to China to study, another great-nephew moved to El Paso and another great-nephew to San Antonio, Texas. The last three, all from one niece's family! So she must feel as if things are really changing for her! A baby was born, prematurely, but is not in the pictures because he was not made aware of my coming to Texas. That was the official excuse! ;) A great-niece started walking, although I never witnessed this, since she was carried the whole time I was there. This time around, no one had gotten married or divorced and no one was pregnant. A nephew and his live-in girlfriend got baptized in a swimming pool and we almost missed that! My mother insisted on witnessing the event but there were no wheelchairs and trying to figure out how to get her to the poolside was a challenge and took lots longer than we ever thought it would! Anyway, here are some pictures of the weekend and baptismal. This is my oldest brother's widow, Maria, her daughters, Frances and Annette, but we call her Nette, and Nette's husband, Juan. I had not seen Maria in 9 years! The last time we saw each other was at a nephew's wedding. These family members came to Albuquerque, NM a few weeks ago, NOT to see me, but to gamble! Maria won $25,000 in the lottery, bought herself a newer used car and they drove to NM to gamble and sight-see! Isn't her luck wicked awesome? I forgot my camera on the day of the baptismal. I know, I know! What kind of aunt am I? I took this picture with my camera phone. This is my nephew, Richard, (Lilly's son, but we've always called him Ricky even though he's something like 35 years old now!) 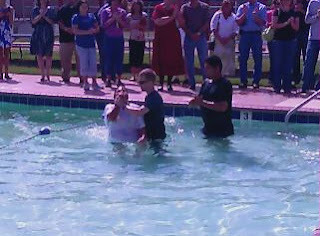 and his girlfriend, Leslie at their baptismal. The church is a young church. And by that I mean, they've not been around long AND all the members are really, really young! They've grown to a population of a little over 100 and the pastor is 25 years old! Praise God! LOL!! Ema you crack me up!! A good read as always!! I'm so happy you were able to go to TX for your BD and have a big bash!! Love all the pictures of you and your family!! Thanks so much for sharing!! I loved looking at all of hte pictures. Looks like you had a wonderful birthday! I really liked all the pictures and your stories behind them. You have a great sense of humor! !